Picking out and wearing an odd waistcoat with a suit needs a little more explication. The previous post on this topic produced some surprise and scepticism, both among friends and on my blog (Permanent Style). The reaction, I find, is similar to that enjoyed by a suggestion on ties with jeans. Both are looks I favour because they add a twist to classic style (to paraphrase Paul Smith); they demonstrate an understanding of men’s style without sticking to a rigid set of rules. They are, however, both hard to pull off. As was pointed out, they are not for the uninitiated, as small things – the weight of the waistcoat, the material of the tie – turn them from personal style into cringe worthy quirk. The key to wearing a tie with jeans is material, as explained in comments to that post. The more casual the material, the better – wool, cotton, linen, in that order; but never silk unless it is knitted (and even then it is perhaps a little too dressy). Proportion, also, is important, with the narrower and more lightweight the tie the less formal it appears. 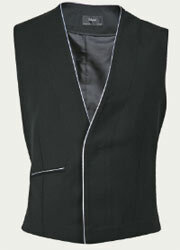 The waistcoat is similar. One reader commented that an odd waistcoat with a suit is “just odd, dandified in the extreme.” I can understand this reaction entirely, especially as the odd waistcoat that springs to everyone’s mind is brightly coloured, or at least lightly coloured – such as the buff waistcoats worn to many formal occasions. But I would argue that if this waistcoat is plain, dark and of a slightly more casual material – flannel works well – it can look very suitable (no pun intended). After all, it is only slightly more dressy than a V-neck sweater underneath a suit, and performs a similar function. Another reader commented that “I would be careful about using the third piece of a three-piece suit as an odd waistcoat. Especially if it is a stripe.” The waistcoat must, of course, be plain. A striped sweater would be hard to work, but possible. A striped waistcoat would not. It must also be dark, falling as a shadow to the suit rather than a highlight. Dark grey with a lighter grey, patterned suit, for example (a checked suit works better than a stripe again, I’ve found, probably because the check is inherently more sporty). Black, also, can work well, though perhaps a little funereal. To avoid this, stick with a blue shirt, not white. As if to prove my point, Kilgour has just come out with a selection of odd waistcoats in black and blue wool with its Autumn/Winter collection. I personally prefer the range without white piping (unlike the item pictured). But the suggestion that the customer might like to wear it with his winter, flannel suit demonstrates how far Kilgour has already run with this idea. Also, having tried one of these on in the Savile Row store, the great thing about the Kilgour odd waistcoat is that it is cut much longer than the average part of a three-piece suit. This reflects the fact that men tend to wear their trousers on the hips rather than the waist today, yet the waistcoat should leave no exposed shirting between it and the waistband. A perennial problem (see the second part of The Waistcoat Theory for more) has been solved. You can follow the discussion on Step by step: The odd waistcoat by entering your email address in the box below. You will then receive an email every time a new comment is added. These will also contain a link to a page where you can stop the alerts, and remove all of your related data from the site. I should mention that dark brown waistcoats also look beautiful with a pair of jeans, whether they are a dark indigo blue or of the more contemporary faded variety. I’m afraid to say I am even more sceptical about odd waistcoats with casual trousers, even if they are not jeans. However, once we remove most of the aspects of formal style, clothes are more and more a case of personal taste. They are also, to be frank, beyond the scope of this blog.